Since amateur poker players started showing up to live tournaments and winning millions of dollars by taking down the so-called professionals of the sport, the online poker industry has literally exploded. Millions of people from across the globe are looking to hone their craft and win some big bucks by playing games like Texas Hold’em and Omaha. And they’re all looking for that proverbial edge to make winning easier. 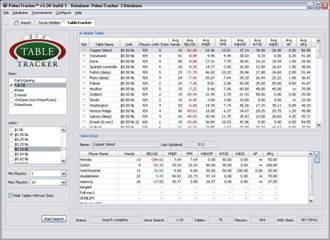 Poker Tracker Software, LLC is the company behind its namesake Poker Tracker software line. In short, Poker Tracker is a software tool that performs a series of statistical analyses during the course of your poker game. By compiling data and quantifying results, Poker Tracker acts as an external brain, so to speak, giving poker players a crucial edge by upgrading the one tool every player needs: Memory. In poker, many will concede that luck is a factor. Hot streaks and cold streaks are real. The power of that blank stare and the coldblooded bluff – these are all essential traits to have. But without a good memory, especially in the online world, a player’s game will suffer. Poker Tracker records and stores all essential details of the game. The software feature has a large database library, keeping track of hand histories, profits and losses, number of hands played, time at the table, the table style (as in limit), and it breaks it all down to a sweet science, calculating graphs of statistics that a player can check to figure out how much they’re winning and losing per hand, per hour and per game. Poker Tracker doesn’t work on every brand of poker. If you like to play best video poker online, then you won’t be benefiting from the software. But for every other poker game, like Hold’em, Stud and Omaha, the software keeps track of your entire game. The real benefit here is that it helps an individual player to understand his or her strengths and weaknesses. By looking at these thorough records that are simplified into easy-to-understand graphics, a player can better know when to bet and when to get out, as well as knowing how much to stake and where to play. Poker is all about percentages, when you really get down to the heart of the matter. A tool like Poker Tracker is basically an odds calculator for every conceivable aspect of the online game. The software is 100% legal. In fact, most of the largest and most legitimate poker sites on the web endorse the use of the tool. So, basically, Poker Tracker isn’t a tool that gives you the edge over other players, per se; it just helps your game to be all it can be. And this is why poker sites have no problem allowing the add-on software to be used in conjunction with their sites. PokerTracker3 is available from their website for $89.99 for the full version, $49.99 for micro stakes, and you can also receive a free trial version to see if you like it. Sounds like an overtly complicated bit of kit to play poker with. it does seem complicated at first, however I have actually tried it and once you get the hang of it it is very easy to use. I agree with Dean Saliba. LOL Yeah, I don’t like using tracker in my poker game poker.williamhill! :\ it’s just it doesn’t feel right and it’s a lil bit complicated! If you only play once or twice a month, a pokertracker is probably overkill, but almost all serious players, use a pokertracker. It can take a bit of time to learn to use one, especially if you aren’t computer savvy, but even then it is definitely worth spending an hour or two to learn the basics. Even if you don’t use any of the statistics a pokertracker giver you, it is still the easiest way to review your play and keep track of your results. In my opinion, playing poker online without a pokertracker is like digging a hole without a shovel – You can do it, but you would be much more efficient if you used one. .-= Jake´s last blog ..Test =-.